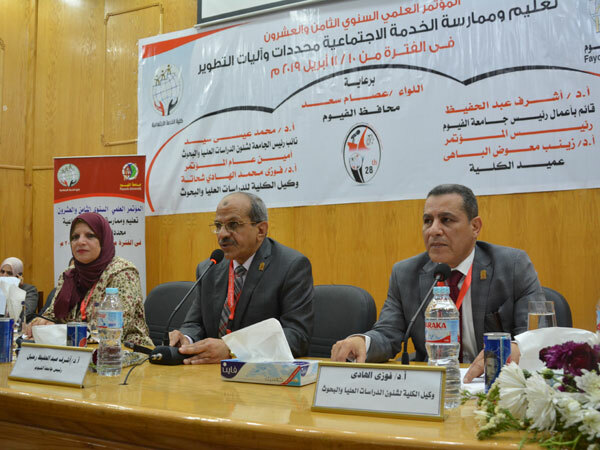 Prof. Ashraf Abd El-Hafeez, Acting President of Fayoum University, witnessed the opening of the 28th Conference of Faculty of Social Work under the title: "Education and Practice of Social Work, Determinants and Mechanisms of Development", on Wednesday, 10/10/2019, at the Central Library. 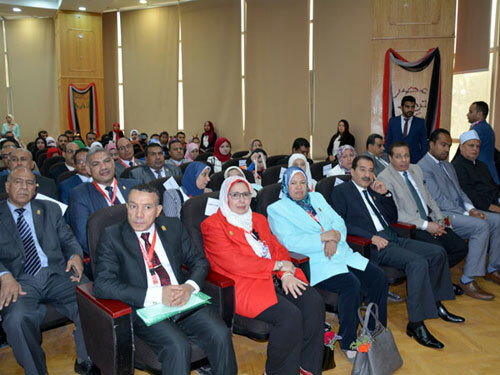 The opening session was attended by Prof. Zeinab El-Bahy, Dean of Faculty of Social Work and the President of the Conference, Prof. Fawzy Shehata, Vice Dean for Postgraduate Studies and Research Affairs and Secretary of the Conference and a number of deans, faculty members and guests participating from different Egyptian and Arab universities. 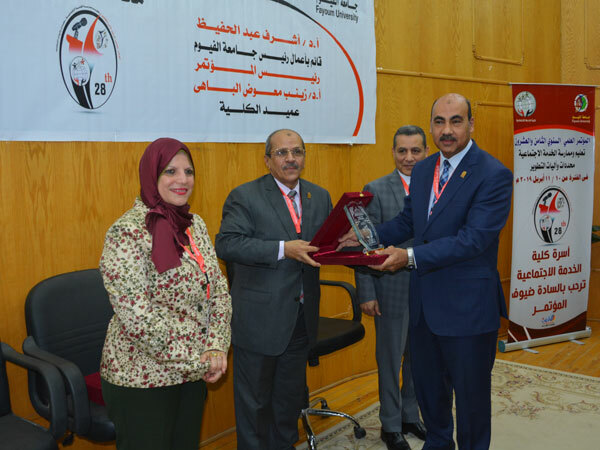 Prof. Ashraf Abd El-Hafeez praised Faculty of Social Work for being one of the most prestigious faculties within Fayoum University and has played a special role in reducing the spread of many negative aspects in the society. He welcomed the conference guests from Arab and Egyptian researchers, stressing that Egypt has started serious steps in restoring its leading role in both Arab and African countries. 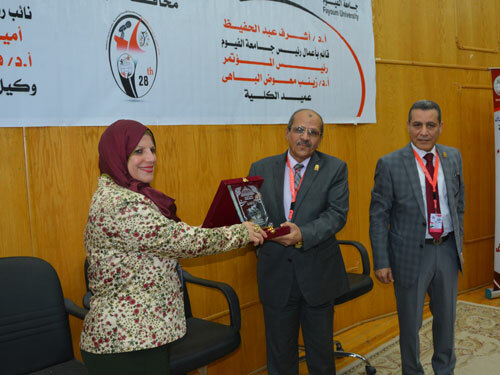 Fayoum University seeks to present its role in this direction, announcing that the University is in the process of establishing the African Forum during the current month. Additionally, he clarified that Fayoum University is proceeding in accordance with a plan consistent with the vision of the Egyptian state in the interest of education and the development of various mechanisms and practices. Prof. Zeinab El-Bahy explained that this conference addresses a number of important issues and objectives, including the promotion of awareness-raising for the development and practice of social work and the pursuit of social creativity in social service education, benefiting from various experiences in this field, and trying to find the importance of modern technology in the education of social service. Prof. Fawzy Mohamed Shehata added that the number of participants in the conference is about 300 researchers and specialists in the field of social work from the countries of Yemen, Saudi Arabia, Sudan, Kuwait, Algeria, UAE, Tunisia, Syria and Palestine, presenting 95 research papers and 13 scientific sessions. 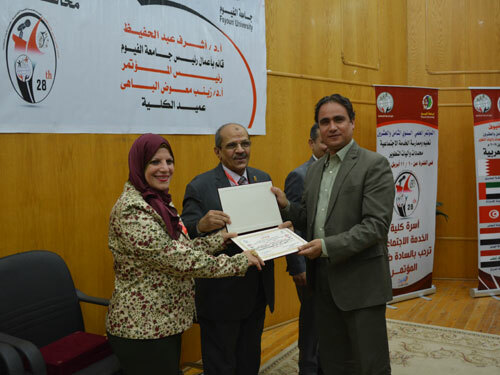 At the end of the opening session, Faculty of Social Work presented the faculty's shield to Prof. Ashraf Abd El-Hafeez, Prof. Zeinab El-Bahy, Dr. Massoud Ismail Executive Director of Information at the University, former Fayoum University presidents, a number of deans of faculties, Fayoum Bishop, the National Council for Women and the heads of social organizations. Moreover, an exhibition of books and handicrafts for students was opened.